Jakarta - In order to celebrate the ‘World Bamboo Day’, CSR of PT. 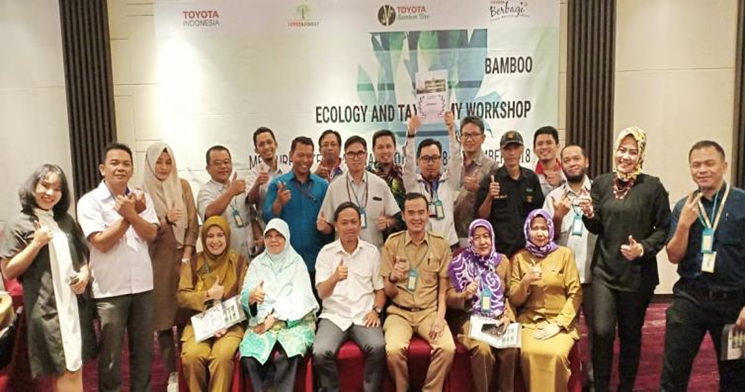 Toyota Motor Manufacturing Indonesia (TMMIN) held ‘Bamboo Ecology and Taxonomy Workshop’ on the 18th of September 2018, which takes place in Mercure Hotel, Karawang. For the sake of educating as well as improving the knowledge of the workshop participants regarding the conservation and utilization of Bamboo Tree, PT. TMMIN held the workshop with the tagline ‘One Bamboo Million Impact’. With the relation to the four pillars of CSR PT. TMMIN which are Environment, Traffic Safety, Community Development and Philanthropy, and Education, Corporate Social Responsibility and Monozukuri Project (CSRMP) PT. TMMIN plan to execute another program that support the “One Car, One Tree” program. In the year 2017, PT. TMMIN together with the stakeholders, held a 1500 Bamboo Tree planting event in Karawang, as one of the plant types that are planted and developed by PT. TMMIN. Other than Bamboo Plant, plants that are developed by PT. TMMIN are Sakura and Mangrove Tree. PT. TMMIN has a huge feeling of responsibility for the societies and communities around it. By holding the ‘Bamboo Ecology and Taxonomy’ Workshop, it is expected to be able to educate and increase the knowledge of related parties regarding the development of “PT TMMIN’s Bamboo Project’ until the year of 2020. Also. PT. TMMIN tie a relationship with the local government to make ‘Desa Budaya Bambu’ (Bamboo Village Culture) in Karawang in order to bring back Karawang as the Central of Bamboo Tree in West Java.